Please refer to our stock # 1769 when inquiring. Antique picture buttons part of a collection ending in the late 70s. Until now, these have never seen the internet light of day. (B) 50+ pc berries, cherry, corn, strawberry, pear, plant life, cut steel, wood on steel cup pair, pewter, tinted, 1/4" - 1 1/2". Please view images 5-7 for details. Instant collection! 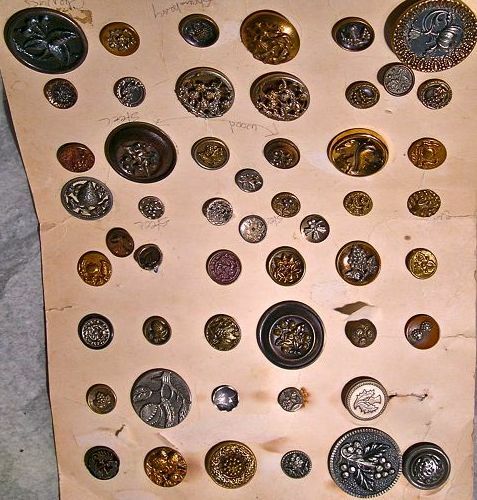 Sold (A) 14 pc net collection Victorian picture button themes: putti dragonfly, angel swing, putto fountain, angel wall, Paris back Aesop's wolf & crane, FOP, bird fence steel, neptune, mill tower bridge, charter oak, train tunnel, Sheba, Eliezer well camel, fan hand, etc. 1/2" to 3/4", multi piece construction, pierced brass, tints, escutcheon. Images 1 - 4 for detail. Will consider Multiple purchase specials with your USA Ck or USPS MO.